On the night of March 15 this year, there was no tear gas, no pepper spray, and no mass arrest. For the first time in a long time, no police violence occurred—no violence at all. The Collective Opposed to Police Brutality (COBP) annual march against police brutality, for the first time in years, actually finished without being subjected to massive police violence. While this will undoubtedly be described by some as “police showing restraint,” we shouldn’t be buying that narrative. There are multiple reasons why the police didn’t break up the march tonight, and the goodwill of the Service de police de la Ville de Montréal is not one of them. Let’s not forget that, a few weeks ago, the SPVM were essentially telling residents of the area to stay inside their homes hide their valuables, lock their doors and be afraid of the demonstration. It was very clear, at that point, that the police were pre-emptively justifying the violence they planned to use. But the organizers made some really smart moves to avoid police repression. Before the demonstration began, the Industrial Workers of the World (IWW) hosted a barbecue at the park where the protest was going to begin. Aside from the pure joy of having an outdoor public barbecue now that the weather is getting nicer, this was also a smart, strategic move. It showed the human side of protesters who had been relentlessly demonized by the police and the media as “thugs” who just want to break stuff. 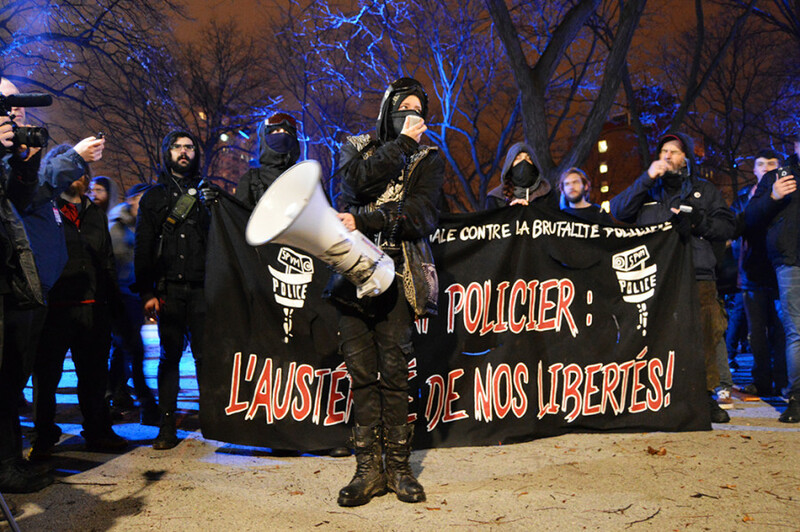 This document – which details the long and escalating repression against the COBP’s demonstrations, as well as the SPVM’s selective application of anti-protest laws – argued that it was the duty of civil society to step in after the municipal government’s failure to rein in the brutality of the SPVM. It was widely disseminated in the media. So the police knew that, this time, they were being watched. The COBP and their allies had effectively created their counter-narrative to the one that the SPVM has been pushing about them for years. The COBP were no longer a bunch of hooligans looking to cause trouble for no reason—they were people trying to exercise their rights, and the police were acting as bullies by denying them those rights. We also need to situate this March 15 within a broader context. The police have been caught brutalizing protesters on multiple occasions in the past year. 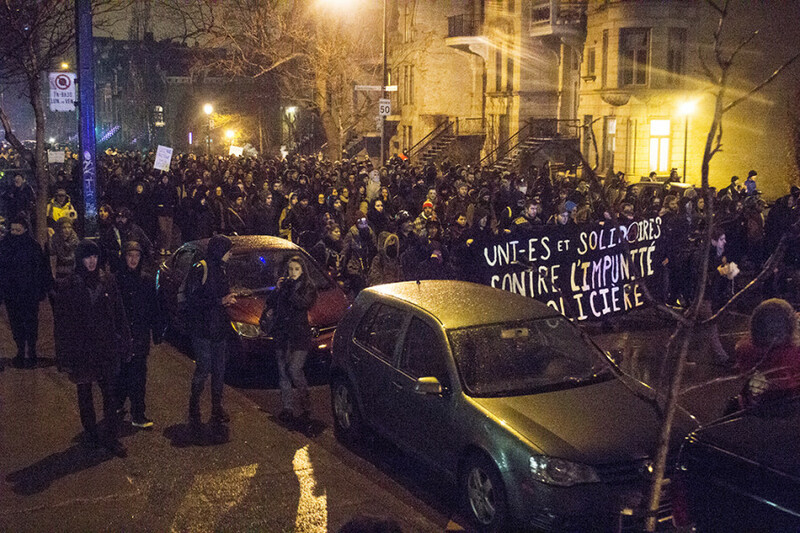 During last spring’s student strikes, agents of the SPVM broke a student’s front teeth as he walked home after a demonstration, and on another occasion put a man’s head through a car window. One officer was caught on camera beating a protester while two of his colleagues held the person in place. In December, undercover police went on a rampage at a protest—beating people for taking pictures, pulling out a gun, and sending one protester to the hospital. These are a few examples among many. The COBP has been helping to construct this narrative for many years now. They were able to see that it was beginning to hold more weight in public discourse, and situate themselves within that narrative before the demonstration. It was a smart move, and that—not police restraint—was the reason why the protest was successful.